Twenty-thousand years ago a cave man makes his way across the Bering Straight to find his entire tribe wiped out along with a large number of Guardians from Oa. A giant space ship appears lodged into the ice and one Guardian collapses to his knees in shock. In the present day Superman pays a visit to his friend J'onn J'onzz who is enjoying his vacation from active JLA duty with his reformed super villain girlfriend Scorch. Despite Superman's reservations about the relationship he wishes them both well and rushes off to respond to an emergency JLA signal. Meanwhile at Arkham Asylum in Gotham Batman finds, much to his surprise and joy, that all of the insane villains housed there have found a new sense of conscience. Their guilt overwhelms them and forces them to beg for forgiveness and death. In the Watch Tower Firestorm continues to teach Manitou's wife how to read and speak English. Little do they know that their budding relationship is being watched through the mysteries of magic. Across the country Major Disaster wakes from a night of fun with the local skank only to find his trailer surrounded. He leaps out into action and discovers that all the mercs outside his house sent to kill him are on their knees mesmerized by the sun and unable to look away. Later at the Watch Tower it's revealed that criminals all over the world are growing complacent and guilty rendering them a non-threat. A JLA signal alert reveals that even the President, Lex Luthor himself, is not immune to the wave of guilt. He's trapped in a coma at the White House. Superman returns to J'onn and asks for his help. They proceed to Washington where J'onn reveals just how deep his love for Scorch really is. It's then that J'onn asks Superman if he really wants Luthor to wake up. Wouldn't it be much more convenient if he remained comatose and helpless. Superman is angered and ends the conversation before it has a chance to really begin. They proceed to the White House where J'onn struggles mentally to free Luthor's mind. As he does a great force is released and strikes back against the JLA. It regards its actions as gifts and it's very offended that the JLA would throw them back in his face. On the moon Fire Storm finds himself suddenly transported outside the Watchtower and in full on Fire Storm mode. Suddenly a force of energy swats him down and absorbs his power leaving him in the cold vacuum of space on the verge of death. Story - 3: The first issue of any arc is a difficult one to judge. We have just a very few vague ideas to go on. The pacing felt off and as each issue progresses in a big bombastic arc like this you still need a beginning, middle, and end even though everything isn't over. And I didn't get a very good sense of the middle. Things felt a little rushed and I'm not exactly sure why we couldn't actually be shown Firestorm's mysterious transportation at the end. It would have made things much clearer. On concept alone though I have to admit I'm very intrigued. The pieces are in place for a good story, I'm just not too keen on how the first issue progressed. Art - 4: Doug Mahnke back on the book and doing an awesome job. I love his Martian Manhunter this issue. Really good stuff. It seems to me that Mahnke always takes special care with the character's centralized in any specific story. Here it's J'onn's turn to get the star treatment. Cover Art - 1: It's half of Scorch and half of an old cover. 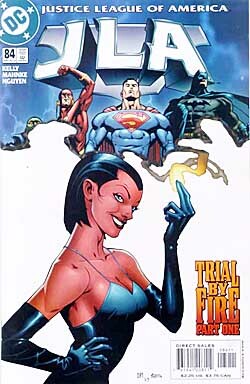 I guess since much wasn't revealed in the issue, not too much could be revealed on the cover.